So since Ashes patch I feel that my latency in game has increased, Use to have SIM at 3.5 and now I have 9 or 10 at team fights, so I’m just curious how many times do I need to click in Scan and Repair because after the scan finishes it says that its downloading some files, then I restart my pc, and try it again and its the same over and over again. So with one Scan and Repair is enough? I even unistall the game, and try to install it again, and its the same. I think it’s a bug or something like that. I could get consistently 120 frames before the patch and now it keeps dropping to 70/80. I hope it gets fixed soon , also the input lag (SIM) has increased a bit with this patch. Same for me. I use to have at 5/6 and now its 10/11. Please note, the screenshots and steps will primarily reflect settings for Nvidia® GTX Graphic Cards and Control Panel, however, there are similar settings in the AMD® Radeon Control Panel for AMD Graphic Cards. There are several settings in your Graphics Card Control Panel that are not available in your Graphics Card Experience suite that can be changed to have a positive impact in your game. To reach your graphics card control panel, go to your Windows Desktop (minimize all programs), right-click any empty space, and select the graphics card control panel shortcut that appears in the pop-up menu. For the most part, keep most of these settings at default unless you are experiencing performance issues overall, however, I recommend changing these four settings for Overwatch. 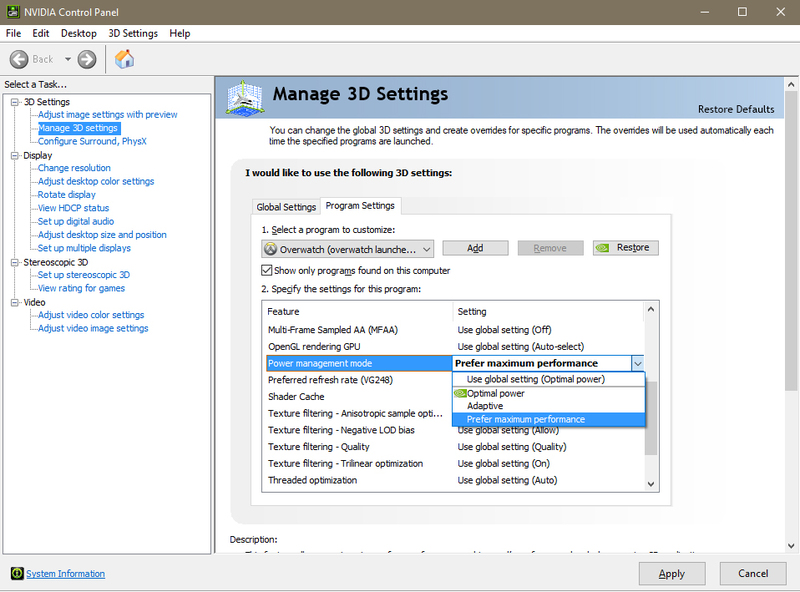 In the Nvidia control panel, you can specify which 3D settings are running for each program. 3D Settings > CUDA – GPUs: Here you can specify which GPU (if you have multiple) are running on your system. I recommend making sure this is set to your desired GPU (most likely your most powerful one). 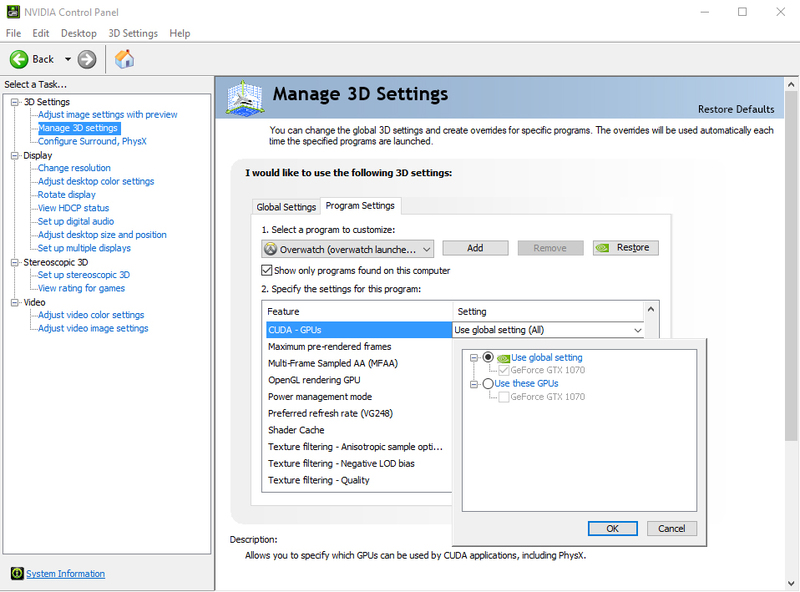 3D Settings > Power Management Mode: Here you can specify the power performance of your GPU. This setting is especially important for laptops. Please note, whenever you play Overwatch on a laptop, make sure to always be plugged into electrical power and not run off the battery. For this setting, I recommend manually setting to Prefer Maximum Performance. 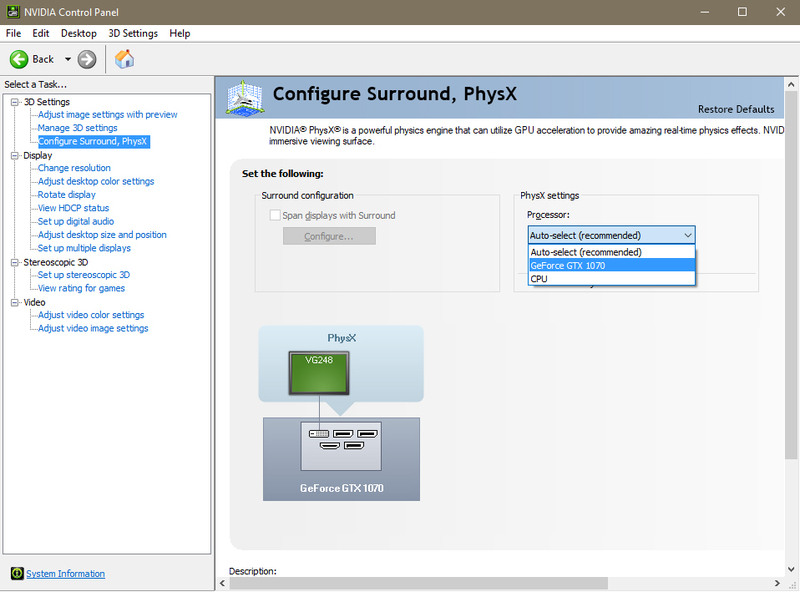 Configure Surround, PhysX > PhysX Setting: This is a global setting to make sure your primary graphics card is being used over the CPU to ensure proper graphical rendering. 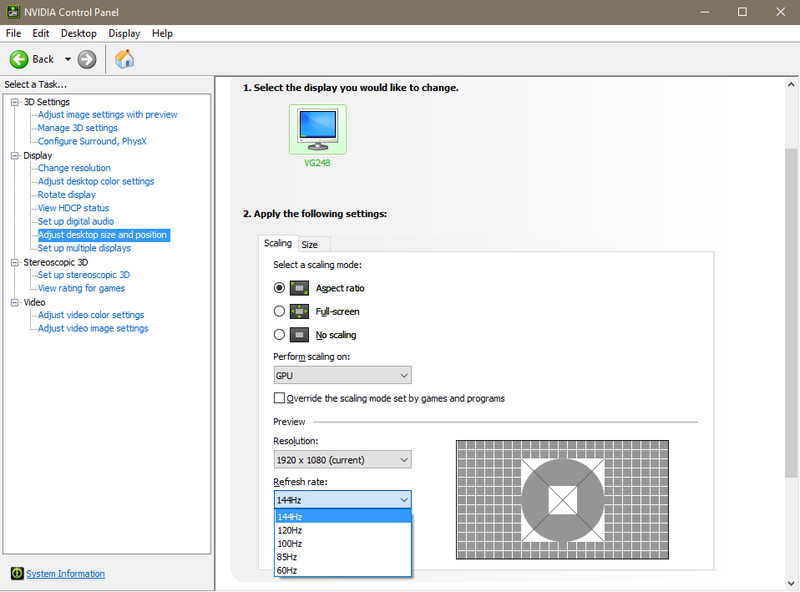 Adjust Display Size and Position > Refresh Rate: Finally, check this setting to ensure you have the highest possible refresh rate being sent to the monitor. 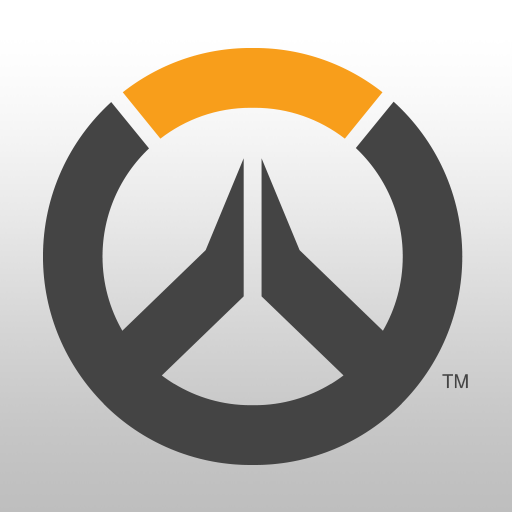 Updating your graphics card driver frequently will in most cases ensure Overwatch will be able to run with the latest patches. You can often update your driver through support programs like Nvidia® GeForce Experience or AMD® Radeon ReLive . In the unlikely event, however, if you are finding that after simply updating you are experiencing low FPS, you may need to consider doing a full reinstall of the graphics card driver. Remember to use Display Driver Uninstaller to completely clean out your old driver. Then download the most recent Nvidia® or AMD® for your system.